5/16" tempered clear glass is ANSI Z97.1 certified. Constructed of acrylic and fiberglass with wood reinforcement. 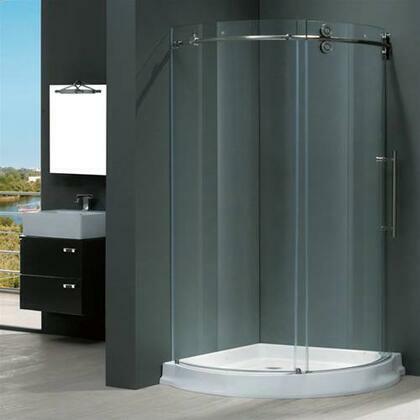 Durable cross-linked cast acrylic shell is extremely scratch and stain resistant, yet renewable because the color goes all the way through the material. Non-porous surface makes cleaning and sanitizing faster and more effective. Multi-layered backing of thick fiberglass / resin-enclosed wood reinforcement to prevent flexing of floor pan. At least 30% thicker and stronger than other makes. Pre-leveled with integrated 1" flange on 2 sides to facilitate installation. Sleek design for a clean modern look, featuring a textured bottom for safety and slip resistance. I purchased a shower surround and pan. Great product and beautiful design. I needed some help and customer service was excellent. I love the look of this shower. Packaging was nice. I will say that the directions of measurements were a little unclear. There were visual drawings (ie putting the side glass door in the shower at the beginning) that need explanation, otherwise you may think you need to make measurements off that item. I had to drill into my wall twice because of that ;-(. Otherwise the adjustments enhancements on the rollers and components were top notch. I purchased this over a month ago and it was recently installed. It looks and works great! Lots of room, the most for a corner shower. Love the glass doors and the quality of the rollers. Just make sure you have enough help because the doors are heavy. awesome, beautiful... happy with purchase.. installed by myself..